Last weekend I flew from Denver to Albuquerque to visit my brother, Zach. He had just moved to Albuquerque to be with his finance. Zach is two years older than me and next October, I am honored to be able to stand shoulder to shoulder as he marries the woman of his dreams. 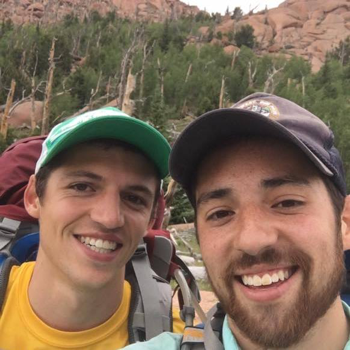 I saw my brother just two months ago when we both happened to be passing through my hometown of Fountain, CO, but we had yet to do our annual brother’s only trip. In 2015, a family friend told us that her two sons, would meet once a year without the parents present. They started when they were both single and over the course of their lives, the meeting grew to incorporate new girlfriends, wives, and then kids. Today, the brother’s and their new families continue to meet up once a year, saving Thanksgiving and Christmas for larger family gatherings. Zach and I grew up and have remained close over the last 24 years, when he initially welcomed me into his family. For our inaugural start in 2016, we backpacked in Lost Creek Wilderness, CO. We had an incredible experience and further bonded over the course of hiking 33 miles in two days. It was one of the first times that we had spent time together since we had finished college and although we both grew throughout our educations, we did not grow apart. We still knew the foundations that shaped each of us. No one else in this world can share in experiences like stealing a box of Oreos from the pantry and sitting in our dog’s house to indulge in those heavenly delights. I think subconsciously we knew the repercussion of our decision and started to make ourselves feel at home. This year, with a busier schedule for both of us, we decided to play it a little more low-key and stick around Albuquerque. Zach had not spent more than a week in his new house and I was looking to escape the drama of my Denver house. Zach let me practice my dusty skill of driving stick, we picked some New Mexico peppers, which were roasted on the farm, and we ventured over to the Sandia Mountains to do what we are most passionate about. We laced up shoes, ditched the shirts and hit the dirt trails. Over the course of a few miles, we caught up on new jobs, semesters, girls, friends, homes and how our parents just got back from three weeks in Ireland and France. We also mentioned that because we both have interests in investment, it wouldn’t be long before the Brother’s Trip took us to a castle in Ireland. Between trying to match pitch to Josh Turner while cooking dinner and reading each other’s minds about splitting plates at restaurants, the best part about our weekend was simply being in the same room. Zach with a pepper pail. Dental school can be taxing on students and loved ones, but I implore everyone to take a moment to think about how they got into dental school. It is through the support of family and friends that we have made it this far and it is with their help that we will make it through. No matter how busy we might think we are, there is always time to appreciate and continue to enrich the relationships that are most meaningful to us. I value hanging out with friends, I rely on my parent’s advice for problems, but I look forward to my Annual Brother’s Trip the most.